Suitable for different aquatorium and different kinds of fishes. Create life-like swimming actions in water to provoke predator to bite. This entry was posted in Carp Baits and tagged 12mm, baits, Butyric, DUMBELL, Pineapple, Reviews, Sticky, Wafters. Bookmark the permalink. I tried a few larger artificial baits with some success; however for general fishing the rule is usually small baits (and hooks) catch large and small fish. Large ones only get the big game. It’s proven to be sound advice and by reducing the hook and bait size I have increased my catch rate. With that in mind I bought some packs of this and have been using them for a few months now. The garden worm is considered a universal bait, and whilst Lug and Rag are excellent there are times you might want an easy to acquire bait. Garden worms are easy to get, but there are times you might be in a hurry or running low. The other obvious problem with live bait is you either buy it (and have to use it fairly quickly) or dig for it yourself. 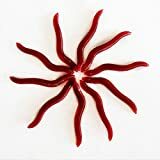 The silicone worms bend quite nicely and feel fairly soft to the touch – they look the part and do appear quite close to a normal smaller garden worm, except these stay on the hooks far easier. Sizes ranges from about 3.5-4cm in length and with a slight sweet odour (possibly from manufacturing or lubrication). Bottom line is I have caught fish purely with artificial bait and these are as good as any I’ve tried – flat fish in particular do like small worms and they will go for these. Pollack and Mackerel also seem to like them – true to form those fish will go for bare hooks if they are hungry enough, though my catch rate has increase since baiting feature rigs with these. As with any bait live of fake there are times fish are not hungry or won’t bite, that’s part of the fishing game. I use live and fake baits and have found both have a place in the fishing kit. These are so low cost for a large quantity it’s really not worth ignoring them. Great looking little bait, they are very realistic looking. I haven’t had a chance to try them out yet but they pretty much fooled me so am hoping they will do the same for the fish. Looking forward to trying them when I go to Vietnam next month..